Collecting or harvesting rainwater is one way to ensure human survival when there is a limited supply of water. It is also a great way to get water for use in our yards. To do this, we need to have collecting containers or tanks and one of the best things to use is the best rain barrel. But there is a problem! There are hundreds of these products on the market today and they come in all manner of shapes, sizes, designs, and materials. Surely, you can choose from any one of them but if you want only the best, you need to know how to go about it. Below is a buying guide and the reviews of the best rain barrels that you will get on the market today. 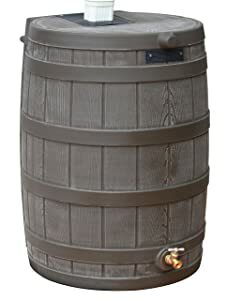 This wooden rain barrel with brass spigot offers dozens of unique features including a screen to keep debris and insects out, ability to connect to other barrels to boost capacity, a shut-off valve for hooking-up a hose with 2 overflows, and a flat back which rests against the wall. The barrel provided about 50 gallons of rainwater. The product is 20 inches deep, 21 inches wide, and 3 feet high, and has a front overflow that prevents any water from flooding outside the walls. It also comes with an optional barrel stand that makes a big difference when resting on the surface and spigot. It also makes it easier to fill cans for any use. RTS recommends that you drain the water when the temperature gets near the freezing point. In addition, you should store your barrel inside your house if you live in harsh climates or leave the spigot open. You can easily drill a hole on the side of the rain barrel in the nub to enable any excess rainwater to flow out. The spigot is easy to find and can be found at any major and minor stores. Further, you can replace the downspout with a flexible plastic spout. Stores up to 50-gallon of pure water. Small opening for pets and children safe. Small opening makes cleaning harder. This oak finished barrel has a 50 gallons capacity. It also features a flat-back that saves space and most significantly it is constructed from an ultra-tough, BPA free, and FDA approved polyethylene material. The unit also boasts of an anti-debris screen and it works with the standard 3×4 inches and 2×3 inches downspouts. The screen is for keeping small bugs and gutter debris out of the barrel. The product comes with a brass plated ¾ inches turn-down spigot that is perfect for standard hose connection. The best thing, you get a plumber’s tape to ensure that you seal spigot to prevent any leak. RW50 also features a front overflow screen that drains excess water to prevent flooding. You can easily fit the barrel with your exterior wall since it has a flat back design. And with its woods fine grain feel, the traditional look and authenticity of the barrel are still beautiful. This is a solid product if you want a rainwater container. The first key feature of this unit is the value it provides at a very affordable price. The unit collects water from gutters and offers you sufficient supply of soft water free of calcium, lime, and chlorine with fewer dissolved salts and sediments than tap water. It has a discharge valve at the base which you can use with a standard 0.5 hose. 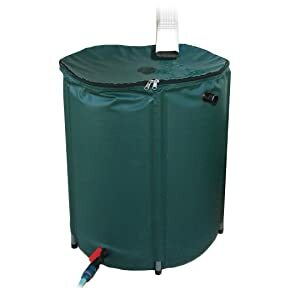 If you wish you had a collapsible rain barrel, then your wish might just come true if you get this unit. The general consensus of users about this barrel is that it’s affordable and is very sturdy. You will also love its portability. This is a beautifully and cleverly designed rain barrel that offers 55 gallons of clean water. You will love the stylishness of this product and its great price. It looks like an ancient terracotta urn. It is made of durable and thick polyethylene resin to ensure that it gives you years of service. Its back is flatted to enable you to place it near the walls or near any flat area. The product comes in 8 different colors; you can easily choose the one you like best. This barrel is a great choice if you want to offer your garden the clean water; rich in nutrients and free of harmful chemicals. The product will not only save you water but also enhance the appearance of your yard. This 50 gallons of rainwater barrel is a gorgeous product that will complement the exterior of your home. It has a planter at the top that enhances its appearance to make it pleasing to your eyes. The unit is both decorative and functional for your home use. It is constructed of high-quality plastic that last-longer, even when used outdoors. The finish of this barrel is attractive and lively, so it’s ideal for any setting. The other feature of this unit is the flat back that enables it to rest against your walls for support and stability. The barrel also comes with a screen for filtering pollutants and debris. It also has a brass spigot that links it to a hose for other use. The best thing, you will get a 5 gallons planter when you get this barrel and it’s UV resistant. Comes with a 5 gallons planter. Although all the 5 products in our list are of the highest-quality possible, our top pick is the RTS Home Accents 50-Gallon Rain Water Collection Barrel. It looks like genuine oak but it’s made of durable plastic that is resistant to insect infestations and rot. It also offers you 50 gallons of rainwater and has a screen that filters dirt and debris. 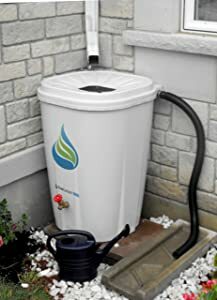 This is a container that harvests or collects rainwater or runoff from your house’s gutter system, joining to the downspout or spout with a fitting under a modified spout or a rain diverter. A hose of spigot connector allows you to drain the water for garden use or other uses. A rain barrel provides an alternative to using well water or the expensive municipal water for irrigation. Your plants benefit from barrel water since it’s free of minerals and chemicals found in tap water. A rain barrel can also reduce the volume of flood or runoff entering your storm sewer, keeping fertilizer, pesticides, and other harmful chemicals out of neighboring water bodies. Rainwater collection for later use also helps to prevent it from entering your basement, crawl space, or foundation. Some towns offer financial incentives for people who use rainwater as a supplement or alternative to municipal water. One of the most popular barrel models is a polyethylene or PVC barrel and is very easy to get it in hardware stores and superstores. 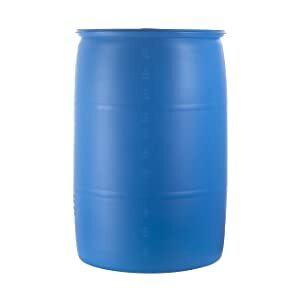 This barrel is quite durable and offers you years of rainwater. This is a classic choice. Although very expensive, its luxurious material will lend beauty to your garden. This type of barrel calls for a higher level of maintenance. Made of highly resistant and flexible laminated polyester, pop-up barrels hold a reasonable amount of rainwater. This type is ideal for colder areas as it is very easy to store in a small room during the winter. The major difference between this type of model and the plastic model is the planter that is found on top of the barrel for inserting flowers. More ornamental, this barrel is perfect for landscape design. The last option is to make your rain barrel. You will need to buy the necessary material and get a rain barrel made from food grade plastic. So much work when you compare to buying a readymade model. You cannot settle on a certain size of a barrel unless you know how much water you will be using. You surely cannot use some of the rain barrels and thrown away the rest. That is not how it works; it isn’t economical. On the flipside, you don’t want a unit that is too small because it will have limited capacity and more water will run into the foundation of your house than in the barrel. Rain barrels come in different sizes. The majority of users go for a 55 gallons rain barrel. This is the most used, together with a 50 gallons barrel. Larger ones are also provided, of course. Small and medium models can hold 40-60 gallons of rainwater. Large models can hold up to 300 gallons of rainwater. Effective surface area of your roof (collecting platform). The simplest way to know the effective surface area is to measure your roof dimensions (include eaves) from the surface. Measure only the parts that will divert rainwater to your barrel, not the entire roof. The pitch of your roof is irrelevant in computing effective surface area (not true surface area), therefore, only measure the effective width and effective length using a tape measure. Let’s us assume your find your roof to be 10 ft. wide and 20 ft. long. Your effective surface area will be given by multiplying 10 ft, x 20 ft. = 200 ft2. Find your state or area average annual rainfall from the weather department website. Let’s assume your location receives an average of 44.8 inches of rainfall annually. Also, note the driest months, make arrangements for these months using the supplements. To compute your rain harvesting potential, you will multiply the effective surface area by annual average rainfall, multiplies by 0.6 (1-inch of rainfall is equal to 0.6 gallons of water/ sq. ft.). Your rain collection potential will be 200 ft2 x 44.8 x 0.6 = 5,376 gallons per year. This is the hardest part. If you intend to use your water for gardening and you have an installed irrigation meter, just check how you have using the municipal water. Again, note that you don’t need water during the rainy seasons. Watering a shrub – 7 gallons. Filling a can – 1 gallon. Washing your car – 100 gallons. Flushing your toilet – 1.6 gallons. Alternatively, time your flow. Record the duration it will take to fill one gallon from a hose. Then water your garden as usual and compute how many gallons you will have used by the time you saturate it. If you intend to use your rainwater regularly, go for a rain barrel that is bigger than 55 gallons. Sometimes, the best option is to get multiple barrels and place them around your house. If possible, buy rain barrels that will collect all the water (in our case, 5,376 gallons) that you will be collecting. Of important, remember that it all comes down to the amount of water you will be using. Determine your needs before you buy your rain barrel. Investing is an affordable rain barrel can be a great addition to your garden and lawn. If you are a starter at collecting rainwater, here are the 6 features that you should look for when buying your maiden rain barrel. Ensure that the barrel is pet, wildlife, and child safe – A rain barrel full of water is good for your lawn but quite dangerous for your pets and children. Check the barrel for unique design features that prevent it from falling or tipping over. For instance, most barrels feature a flat back to enable them to rest on the wall or fence. Ensure that the barrel has an overflow spigot – An overflow valve or spigot helps to regulate the flow of water in your rain barrel. It drains the water when the barrel is full. Dual overflow valves offer optimum operation. Ensure that the barrel has a mesh screen filter – Roving insects or wildlife and hard rains can push leaves and other debris into your barrel, making the rainwater dirty and even damage the interior of the barrel. A mesh screen filter blocks all these things, but the minute of them. 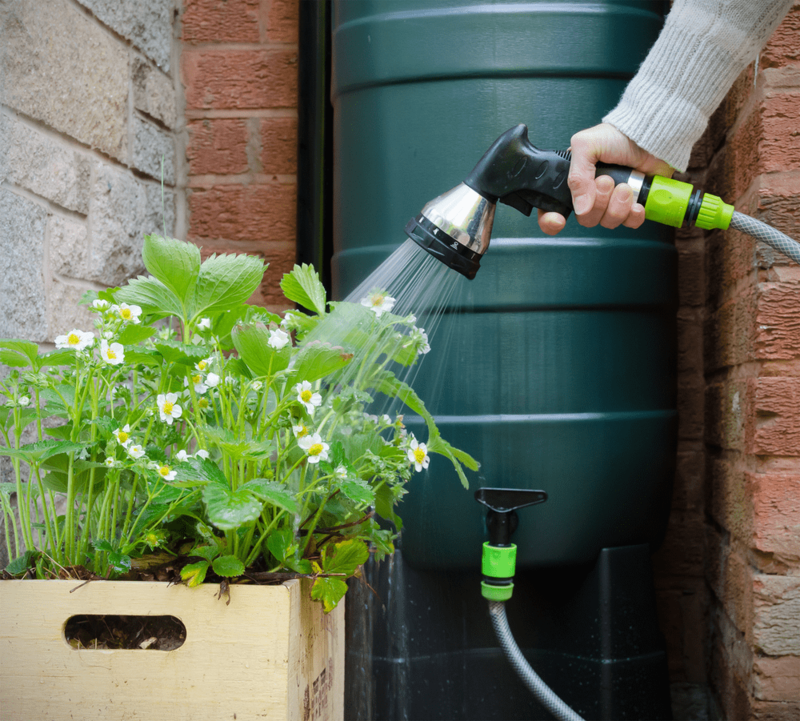 Ensure that the barrel is connectable to other barrels – If your gardening or landscape needs change – maybe you have added a vegetable garden – you will need to expand your water collecting capacity. Hence, ensure that your unit has hardware that you can join with another barrel. Choose durable material – Why durable material? Your rain barrel will remain outside come sun, come rain. Therefore, ensure that you get a heavy-duty barrel, such as resin, as it will withstand harsh elements; it won’t rot, peel, or crack. Although wood is recyclable, it is not durable. Buy a barrel with warranty – A long-term warranty provides you protection against manufacturer’s defects. Read the warranty before you buy the barrel to ensure that it covers shipping costs and replacement parts. Note that most warranties don’t cover damages incurred by the owner, so always ensure that your barrel is repaired and maintained by the manufacturer. Before you install your rain barrel, ensure that the downspouts and gutters are clean and working. Note the following: The process of installing your barrel will depend on the model you have, so always follow the manufacturer’s guide. Determine which downspout you will use with your rain barrel. Note the following: Don’t connect your barrel to any part of your irrigation system connected to your plumbing or your home plumbing. Assemble your rain barrel. Assembling might include installing hose connector or spigot and connecting the overflow pipe or hose. Collapsible models require more assembling work. Prepare the site where your barrel will rest. If you intend to put it on the ground as opposed to a concrete pad or patio, dig the ground out to a depth of at least 1-inch and use sand, pavers, or gravel to create a level and stable surface. Set up a sturdy platform or stand if you want to elevate your rain barrel. Note the following: If you elevate your barrel above the surface, ensure that the structure you use supports the weight of a full rain barrel. Place your barrel next to the gutter downspout. Configure the spout to direct rainwater into your barrel. Before boring or cutting into a spout, ensure that there are no electrical cables running or heating through it. Mark carefully (follow the manufacturer’s instructions). Cutting the spout to enable your barrel to fit under and fixing an elbow area, if required. Cutting or boring out an area of the spout and fixing a diverter that joins to your barrel and a hose. Replacing part of the spout with a customized part or flexible spout fitting that can fill your barrel. Note the following: Wear eye protection and gloves when boring or cutting into the gutter downspout. Also, protect your house’s exterior while boring or cutting into the spout by placing a piece of wood behind the spout. Position and level your barrel. Direct your barrel’s overflow to prevent the water overflow from flooding your house. Your rain barrel might have an overflow hose or you might need to buy one. 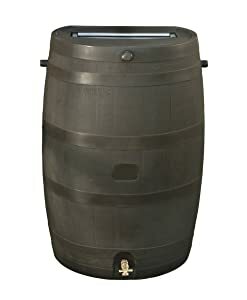 Q: Can I get a larger capacity rain barrel than the one you have reviewed? A: If you do lots of gardening or uses large amounts of rainwater, you might find even the largest barrel on our list to be insufficient to fulfill your needs. If you want a larger capacity unit you can either go for an industrial-sized model or chain two or more of the average-sized barrels with linking hoses. Many people chain them together. Q: Is rainwater in a barrel safe to drink? A: No. This water has a variety of pollutants, debris, and bacteria. It isn’t 100 percent safe to drink. However, you can make it safe to drink with thorough filtering and treatment. However, you shouldn’t do this unless you know what you are doing. Q: How long does it take to fill a rainwater barrel? A: If you place your barrel under a drainpipe, it might get filled up over the course of a rainstorm. So, it is advisable you get at least three of these units if you live in a wet place. What is the best rain barrel on the market? The best barrels on the market are produced to hold sufficient water for your yard and other home uses, is pet and child safe, and inhibits the development and spread of dangerous microorganisms. The water it contains should be safe for use but not for drinking. Unless the container is BPA-free, you shouldn’t drink that water. We all know how frustrating weeds can be when in our beloved gardens and flowerbeds. But what can you do if you don’t want to use harmful chemicals weed killers to kill these weeds or if these chemicals don’t work for you? Still wondering! The answer is to get the best weed barrier for your garden. Our gardens lose their productivity when annoying weeds drain their nutrients. Flowerbeds lack their attractiveness when infested by unsightly weeds. You require the perfect weed barrier to prevent your beautiful garden from becoming weed gardens. We have done a comprehensive research and found the best barriers on the market today. But before we look at their reviews, let’s jump into the buying guide of weed barriers so that you can have an idea of what to look for when you visit the market. Here are the top 5 weed barriers on the market today. If you are worried about crumbling ground and soil erosion in your garden, then Scotts 25-Year Pro Fabric is the product for you. This 3 by 150 feet weed barrier from Scotts offers superbly design features for controlling weed while preventing soil erosion. The fabric is designed with long-lasting nature in mind but it’s still light enough to be lifted and installed in your garden with ease. When it comes to the texture, unlike most barriers which are designed with a touch of flimsy plastic, this unit is made of quality fiber. 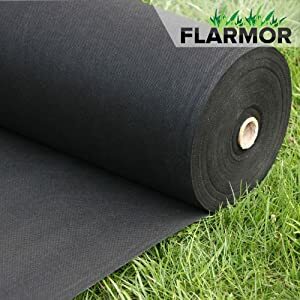 It’s durable and also very easy to cut which makes it the perfect choice for users who want to install a landscape fabric by themselves for the first time. Although Scotts is very popular and they have developed a good relationship with customers over the years, this barrier is quite affordable when compared to those of other brands that sell products of the same measurements. Last for at least 2 decades. Easily tears via sloping areas. The last issue you want is to keep on reinstalling your weed barrier regularly. Not only will this be quite tiring but also pocket draining. Therefore, if you are searching for a barrier that is both affordable and durable, then Dewitt 12-Year Weed Barrier might be your best bet. Dewitt offers optimum durability and has developed a brand that guarantees that clients are getting value for their money. Also, the brand has a great reputation for ensuring that weeds don’t develop in your garden for a year. Although slightly thicker than other barriers in its class, this unit is lightweight which makes it very easy to cut into manageable pieces and install. This product is also environmental-friendly and it comes with the latest features. Among these features is the construction fabric which is made via the spun-bond method. It is a great choice for ensuring that weeds never show up in your garden. One key factor for killing weeds of this barrier is the carbon-black element in its material which makes sure that sunlight doesn’t reach the weeds. The product is also hydrophilic treated to offer optimum permeability of nutrients needed by your plants. Doesn’t allow light to penetrate. What makes this barrier unique is that it features a Sunbelt ground cover. The product also allows air and water to reach the roots of your plants. It also features UV stabilization, making it a great choice for greenhouse and outdoor use. This weed barrier has a great length of 300 feet and offers a sufficient width of 4 feet, making it ideal for use in most gardens. Another great feature of this unit is the high-quality woven black polypropylene material that ensures that the sun doesn’t reach the ground. The product comes with half a decade warranty, which is the number of years it will offer you services. The product allows easy seep of water and air to the ground to facilitate your plant growth and it is very affordable. UV stabilized and permeable to water and air. Water penetration should be improved. This product is quite popular when you consider the number of positive reviews it has received from buyers. It is an excellent weed barrier that can be used for other Landscape projects without compromising its results. One of the most notable things about this unit is its effective control of soil erosion. It has the ability to hold the soil and still provide long-lasting weeds control solution. You can also use this product to create walkways in your yard which offer a classy garden. When compared with other weed barriers of its measurement, its price is a bargain and the best thing; you don’t need to add any chemical to kill the weeds. A bit hard to handle. 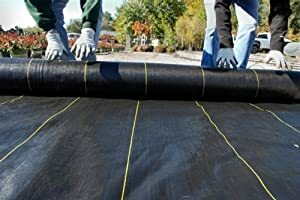 This weed barrier comes sealed in effective rolls of 3 x 300 feet to offer you a barrier that will take care of all weeds. The product helps to block all weeds from growing and consuming the valuable minerals of your plants. This barrier is perfect for a short-term project for yearly planting and thus great for vegetable garden. It consists of 3 layers of laminated spun-bond fabric for extra light blockage and added strength. The unit is made of polyethylene plastic material that helps to block the germination of unwanted plants. The other great thing about this unit is that it helps to prevent soil erosion and boasts of a durable construction. The nonwoven geotextile fabric of this barrier offers specific functions like resilience, softness, stretch, liquid repellency, strength, absorbency, washability, flame retardancy, sterility, package protection, filtering, cushioning, and bacterial barrier. These properties combine to form a commercially heavy-duty weed barrier. Prevents sunlight from reaching the ground. These 5 choices are great choices. If you went for any one of them, you would be getting value for your money. With that said, the perfect weed barrier should control weed, prevent soil erosion, last for decades, be lightweight, and be easy to install. This is precisely what Scotts 25-Year Pro Fabric 3 x 150 feet is all about. Some people use the natural barriers to prevent weed growth. They put natural materials around their plants to prevent the weeds. For instance, a thick layer of peat moss, mulch, or leaves can be very effective for blocking unwanted plants. Natural materials are highly biodegradable, and thus you will need to replenish them annually. Again, natural barriers such as mulch and straw have weed seeds. They can make your weed problem to be worse. This barrier can block the sun from reaching the surface when spread over the garden or weed. It prevents the weeds from getting sunlight, water, and oxygen. The black color of the barrier easily absorbs the heat from the sun, and this helps to keep the soil warm. In turn, this helps the root of the surrounding plants to develop. You can go for fabric barriers when you want to prevent the weeds from growing. These barriers are made of synthetic geotextile material. 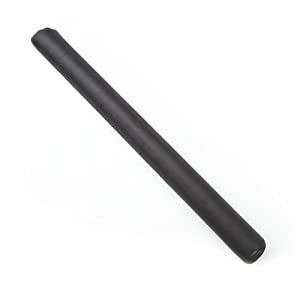 They also feature a lamination that is made of black polyethylene material. The lamination is simply a thin layer. The lamination darkens the soil by blocking the sun from reaching the surface. Weeds and other plants get starved because they don’t receive the light required for their growth. The interesting thing about weed barriers is that you can easily make one from your home. For instance, you can make use of old newspapers and plastic bags. You will get a lot of tutorials online on how to create these types of barriers. The major issue with these barriers is that they decompose into your garden after a while. They also look disorganized and messy. The last problem is that strong winds can blow them away. By now you understand that there are hundreds of weed barrier options available out there. However, buying a barrier that will serve your needs can be tricky and hectic. You need to make the right decision and the following tips and tricks can help you to do this. Always try to make your purchase based on the number of units sold. The reasoning behind this is that if many units of purchase are done then the weed barrier must be good, otherwise users wouldn’t have bought it. However, this is not applicable for weed barriers that have just launched or have faced explosive buy. You should apply this trick only in cases of regular purchase over a certain period, like 5 years. If you buy your product online, always ensure that you purchase from a trusted website which will safeguard your interests. There are websites that sell damaged products to unsuspecting customers. Additionally, the same case should apply if you buy from a local store. Reading weed barriers review is a superb way to determine if the product will perform its job effectively. The logic behind this is that buyers are using it and they already know how it works. This way you will get unbiased opinions about the barrier and even know the pros and cons of buying a specific barrier. 1. Do I have a long-term project or a temporary project? When you are hunting for a weed barrier, the first thing that you should know is the nature of your project. A long-term project has its unique needs while a temporary project has its needs. Plastic weed barriers are the best for long-term projects. When you use these barriers they play a critical role in reducing soil moisture loss. The other major benefit that makes them the best for the long-term project is they don’t develop tears easily – they can last for decades. The downside to plastic barriers is they are quite expensive but worth your money. Fabric barriers are perfect for the short-term project because they aren’t durable. After a while, the textile material became soft and begins to tear. 2. Do I need a breathable fabric? This is a matter of where you want to use your barrier. Remember that you want to kill the weeds while allowing your plants to breath. Plastic material barriers will not allow any air to get into the soil. 3. Do I want my garden to look clean? The main purpose of using a weed barrier is to ensure that your garden looks clean. The worst thing that you can do is to use a barrier that does not match the color of your garden or choose a product that makes it look dull. 4. Is my weed barrier easy to install? It is a waste of time and money to call a professional to install a weed barrier in your garden. 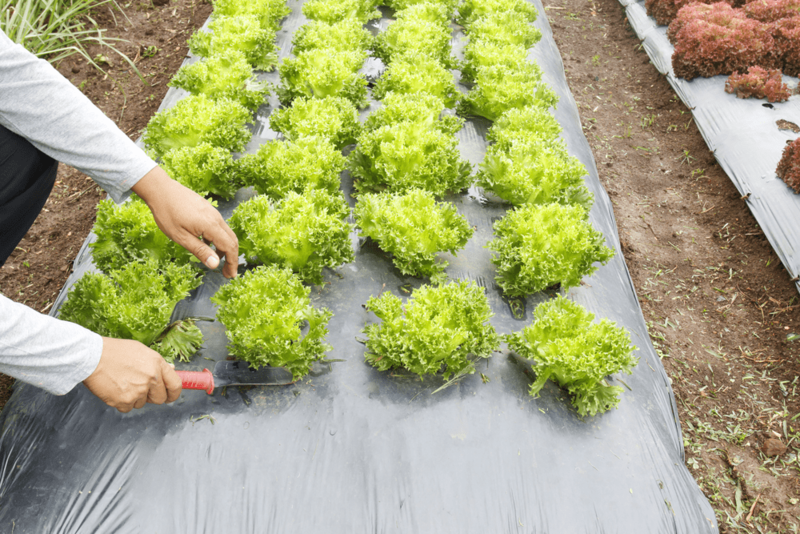 Instead of buying a complicated product to prevent weeds from growing, choose a model that is easy to install using a pair of scissors and elbow grease. 5. Am I an environmentally conscious person? The perfect weed barrier should be effective at preventing weeds – not killing other organisms in your garden. There are other living things in your garden that help to balance its composition such as butterflies, ants, bees, and worms. Preventing weeds from spreading in your garden – Weeds are quite damaging to a yard and they are quite persistent. They are the major reason why plants don’t flourish as they should and this is because they take valuable nutrients from the plants. Weed barriers offer your plants a chance to grow by preventing weeds from spreading throughout your garden. Controlling soil erosion in your garden – Although weed barriers are both permeable and porous, most of them are quite effective in preventing soil erosion and crumbling. These products are beneficial especially for lands with slopes and hills. Preventing mulch and stones from sinking in your garden – Weed barriers also prevent rocks, stones, and mulch from sinking into the surface. This will save you hundreds of dollars since you don’t need to replenish your mulch after a few months because of sinking into the ground. Durable, easy to install, and use – Most weed barriers can be cut and installed in your land easily. They also happen to be sturdy and resistant to punctures, cuts, and tears. Some of them take longer to decay or mold. Comes in different colors and sizes – Weed barriers are manufactured using different materials and come in different sizes and colors. This enables you to choose the one that fits your garden the best. In addition, weed barriers offer the following three benefits. They save you a lot of time and effort that you would use weeding your garden. They can be used to create walkways in your garden. They are very durable and don’t need maintenance. Clear the ground – the first thing is to clear existing weeds from the surface you want to install your barrier. Flatten out the soil – the next thing is to flatten out the surface using a rake so that you can level stones; they might damage your barrier. Place the barrier – now you can install your barrier on the surface and use staples to fix it firmly. Place gravels and mulch – place them on top of the weed barrier in order to fix it into position. Complete the installation – your installation process is complete now. Do you know how to identify weeds? It is best you know what you want to remove from your garden in order to save the balance of your yard. A weed is any plant that grows without being sown. A weed is any plant that grows where it isn’t wanted. A weed is any plant that is competitive, persistence, and interferes with your activities. Weeds have abundant seed productions. Weeds have a rapid population. Weeds have the qualities of vegetative reproduction mechanisms. Weeds have the ability to grow in places where people are disturbing them. Weeds seed have a long-lasting life when buried. Achillea millefolium (Yarrow) – This weed often appears as a group of creamy white flowers. They grow and do well in arid and semi-arid areas that have local store. Bellis perennis (Daisy weed) – This is a perennial weed. They feature white petals and have a yellow center. Cirsium arvense (Creeping thistle) – They have spiky, twisted thistle-like leaves and purple flower heads. This weed often occurs in recently seeded lawns and bare spots on grasses. Glechoma hederacea (Ground ivy) – This is also a perennial weed that shows in a group of violet-blue flowers with glossy, scalloped, and round leaves. Plantago major (Great plantain) – This is yet another perennial weed that features broad, oval-shaped foliage. It produces greenish-gray flowers. Ranunculus repens (Creeping buttercup) – This weed has three-lobed leaves with yellow flowers. It spreads using its root system. Senecio jacobaea (Common ragwort) – This weed has yellow star-like flowers as well as bluish-green lobed leaves. It is toxins and hence you should handle it with care. Taraxacun officinale (Dandelion) – This common weed produces yellow flowers that change into white seedheads when they mature. Installing weed barrier is one of the best ways to prevent and control these weeds from growing in your yard. Q: There are weeds growing under my weed barrier. What might be the problem? A: The major cause of weed growing under a weed barrier is improper barrier application or some extremely stubborn grasses or perennial weeds. Ensure that you follow the installation instructions that come with your barrier. Q: I have installed my weed barrier and the water I not passing through. Why? A: Some barriers come with a coating that makes them roll easily. After one or two days, this coat will break down and the water will pass normally. Q: How many inches should I put one anchoring pin from the other? A: Generally, every three to five feet apart will be sufficient. We all love the small garden in our backyard. Making it appear beautiful isn’t the only thing that you should do. You need to be dedicated to it so that you can eliminate all the weeds from it. We hope that the above weed barrier article has helped you to know “what is the best weed barrier” for your garden. 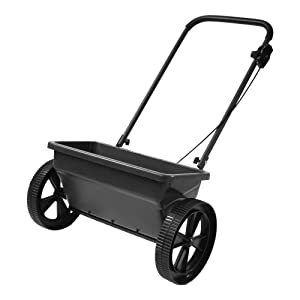 A drop spreader is one of the most important gardening and landscaping equipment that you should own. A spreader is a machine used to spread seeds, soils, fertilizer, and other material that you want to apply to your garden. It helps to control the number of items spread on your garden and this ensures that the lawn is well nourished. A drop spreader serves its purpose quite well when used the right way. It works just like its name suggest. As you push it along, fertilizer or seed are dropped to the garden through holes in the bottom side of the hopper. To achieve this, you need to have the best drop spreader. The first spreader on our review is the Scotts Turf Builder Classic Drop Spreader. This has been a regular in the lawns for over a decade, and it will continue to be for long. Perfect for: Medium sized lawns. Max coverage: Up to 10,000 sq. ft. per load. 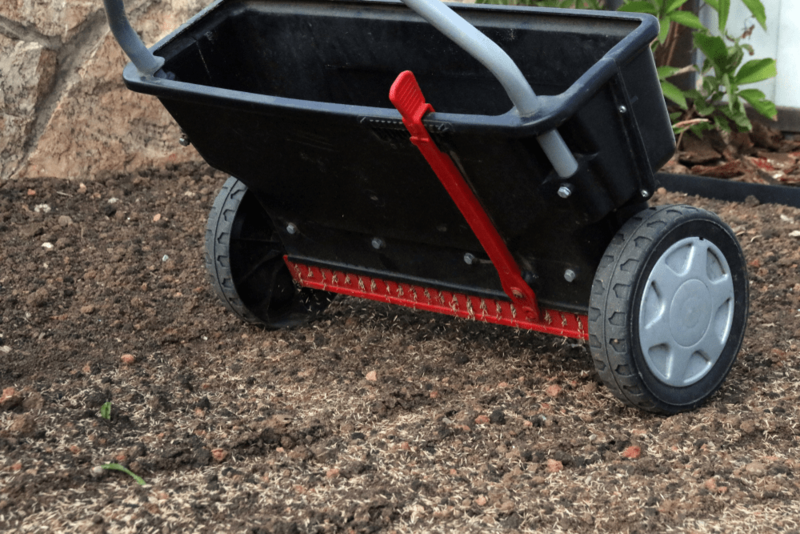 This spreader is perfect for users with a garden that is at least 5,000 sq. ft. and an area that requires precise seed or fertilizer application. It offers a much even application but to achieve this you need to do more pass to apply the area effectively because it only offers 22 inches of application. The machine is made of heavy-duty materials and will offer you decades of service without needing to hit the market in the near future. Its frame is quite sturdy and will survive any punishment that comes along. It comes fully assembled ready for action, and although its’ calibration is way off, you can easily re-calibrate them to your desired setting. The spreader is perfect for fertilizer spreading as well as other materials. Now we move to the big toy for big girls or boys and I really love the Agri-Fab 45-0288 175-Pound Tow Behind Drop Spreader. It can hold about 175 lbs. of material and it does an effective job of spreading. Type: Tow behind drop spreader. Perfect for: Ride on mower users and large lawns. Max coverage: Up to 40,000 sq. ft. per load. The sheer sturdiness of this spreader is astonishing – it feels like you can drop this machine over a cliff and still work after hitting stones. Its poly hopper is strong, and the metal frame will last for decades. 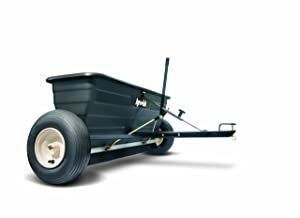 The spreader comes with pneumatic tires which also happen to be tough and offer the much-needed difference when towing the beast behind – it simply glides over most dips and bumps. The adjustment level is amazingly straightforward, even a child can easily use it. 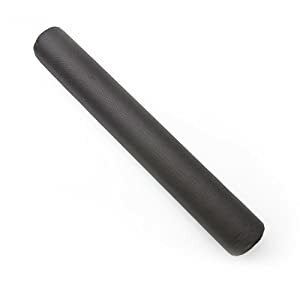 One thing I thought I should mention is that its agitator blades are thin, and depending on the material you want to spread, you might run into some problems. This might look like a shortcoming but it good you understand that the spreader was made for grass seed. Agitator blades are somehow flimsy. The last, but not least, spreader on our list is the Precision Products 75 Pounds Capacity Deluxe DS4500RDGY Drop Spreader. Precision Products has been in business for decades and offers high-quality lawn apparatus at an affordable price. This is a straightforward product that is simple to use and easy to carry from one point to another. Its price is one of the best you will be offered out there, and considering its quality, you get value for money. The machine comes with a poly hopper that holds up to 75 pounds of fertilizer or seeds and features durable 12 inches plastic poly wheels that are rust-free. 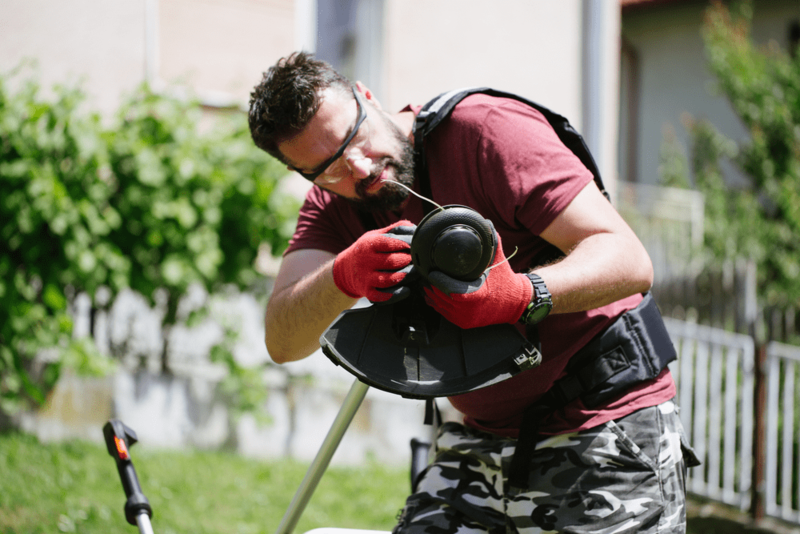 The product is rigged with a simple mechanism, which is ideal for users who simply want to get their lawn job done with minimal maintenance of the spreader. It evenly scatters fertilizer, seed, and other granular elements without going overboard, eliminating clean-up needs after every spreading season. Even scattering without going overboard. Tires aren’t suitable for rough terrains. 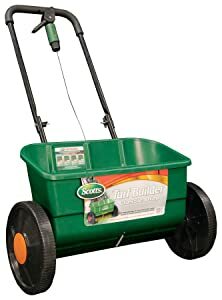 We can recommend Scotts Turf Builder Classic Drop Spreader as the best unit from our review since it has most of the features that a drop spreader should have. These include heavy-duty materials, sturdy frame, spreads a variety of items, and ability to re-calibrate. Before reviewing the top three drop spreader on the market today, let’s first go through what qualities make up a great spreader. We will use these criteria to determine the best spreader in our review of the top spreaders. But you might be asking yourself, “What the need of looking at these attributes?” This is to ensure that you have all the information you require to make an informed decision when searching the market offline or online for a drop spreader. This is straightforward. Your drop spreader should perform well, especially on your lawn. It is a great idea to choose a heavy-duty spreader that is resistant to extreme weather conditions and resistant to corrosion such as a unit made of durable plastic or stainless steel material. This will ensure that your unit last-long. Corrosion, harsh weather, and rust are one of the most common things that affect the performance of a spreader. The primary application of a spreader is to scatter fertilizer and seeds evenly across your garden, but for extra efficiency, your spreader shouldn’t be limited to only these two uses. The best model can also be used to remove and prevent ice from pavements, driveways, and sidewalks during winter seasons. Additionally, you can use these machines to spread granular material, which enhances the greenness of your lawn and keep weeds away. Their hoppers should also hold sand for other construction and landscaping purposes. Durability is a critical component of a top spreader, but how can you really know whether your unit will last long? The answer is simple: look at the material used to construct the spreader. For one, the axle and wheels should be constructed of heavy-duty rust-free materials that are also suitable for your terrain. Price will vary depending on the materials the spreader is made from, its design, the controls, the quality of the wheels, and where you buy it. The controls and the material used to set the settings will determine how much movement you will get on the accuracy. If it is easy to re-calibrate these settings you will always feel happy with your machine and how it applies the produce on your lawn. Drop spreaders and broadcast spreaders basically do the same job but they are different machines. A drop spreader spreads fertilizer or seed in even rows, and these models are famous for their pinpoint spreading or accuracy. The items fall only where you want them to fall. The scattering pattern of these units only extends to the length of the wheels, which means that you need to overlap your path every time you cross your lawn. The majority of manufacturers recommend you set your spreader at about 50 percent and spread your fertilizer or seed in a crosshatch manner. This will ensure even coverage and prevent stripping. They work well in areas that are about 5,000 sq. ft. in size. They offer efficient coverage control and are easy to operate. They have a wide wheel bottom that makes them easy to move over and around obstacles as well as tight areas. The wind doesn’t affect their performance. Because they distribute the product in “swaths”, you don’t need to clean anything near or on sidewalks or driveways. The major con of choosing drop spreaders is that they usually cover less surface with every pass than broadcast spreaders, which increase the number of passes you need to make and the time required to complete the chore. However, due to their precision, we can without a doubt say that the tradeoff reasonable. Broadcast spreaders are called broadcast because they spread your fertilizer or seed in a fanlike manner over huge tracks of lawns. The size of their scatter depends on your speed and the size of spreaders’ holes. The distribution becomes thinner as the seeds are broadcast further and further from the machine. Therefore, you need to ensure that your passes across your lawn overlap to get an even spreading. Just like the drop spreader, the manufacturers recommend that you set these units at 50 percent and spread your fertilizer or seed in a crosshatch manner. They usually cover more surface within a short time. They are perfect for large lawns and wide areas. Their hopper capacity is bigger than those of drop spreaders. The major issue with broadcast spreaders is that they often spread the product out of bounds, which leads to wastage and need for cleaning. You should calibrate your spreader every year to guarantee accurate usage. In most cases, these spreaders come set to ensure that you don’t get hard time calibrating. As your spreader gets older, these calibrations get out of order and your machine doesn’t apply the right amount of fertilizer or seeds anymore. Make a box-shaped or V-shaped trough out of a piece of an aluminum gutter or heavy cardboard. Attach the trough under the output section of your drop spreader to catch the product as it spread out. Use a baling wire to attach it. Set your spreader at the manufacturer’s recommended number, put seed or fertilizer into your spreader, and push the machine over a 100 sq. ft. area. 1½ ft. wide, move forward 66.6 ft.
2 ft. wide, move forward 50 ft.
3 ft. wide, move forward 33. 3 ft.
Pour the seed or fertilizer that fell into the gutter or trough, weight it, and then multiply the figure by 10. This will give you the amount of seed or fertilizer that you would need to apply for 1,000 sq. ft. Most products are given on a 1,000 sq. ft. basis. In case you applied too little or too much, adjust the setting appropriately. Q: Do drop spreaders have an advantage over broadcast spreaders? Do they have any disadvantage? A: A drop spreader enables precise spreading along flower beds which is not possible with a broadcast spreader. The con of these units is that they take longer to complete the job when compared with a broadcast spreader. Q: How do I maintain my drop spreader? After every use, empty all remains into their original packaging. Clean your spreader over your lawn to remove all the remains that might be clinging around, especially near the axle. You might require hot water to clean any stubborn remain. Leave your spreader to dry for a while before you take it to your store. Oil the axle bushings frequently using a light lubricant, preferably spray. Avoid heavy grease or oils since they might attract dirt, which leads to wear. With the dozens of features and controls included in drop spreaders, it can be difficult to answer the question of, “What is the best drop spreader on the market? Luckily, having a clear mind of these products will help you when choosing the best unit for your lawn. Know the features and qualities that you should consider when making a decision and your purchase will be smooth. Maintaining your garden or backyard should be a continuous process if you wish to enjoy the best outcome from your plants and lawn. Lawn-maintenance takes different forms. Whether it is investing in the best hosepipe or the best fertilizer spreader to give your garden the nourishment it requires or plenty of the best lawn fertilizer for your yard, there seems to be no end to the number of tools you can purchase to make your gardening life easier. 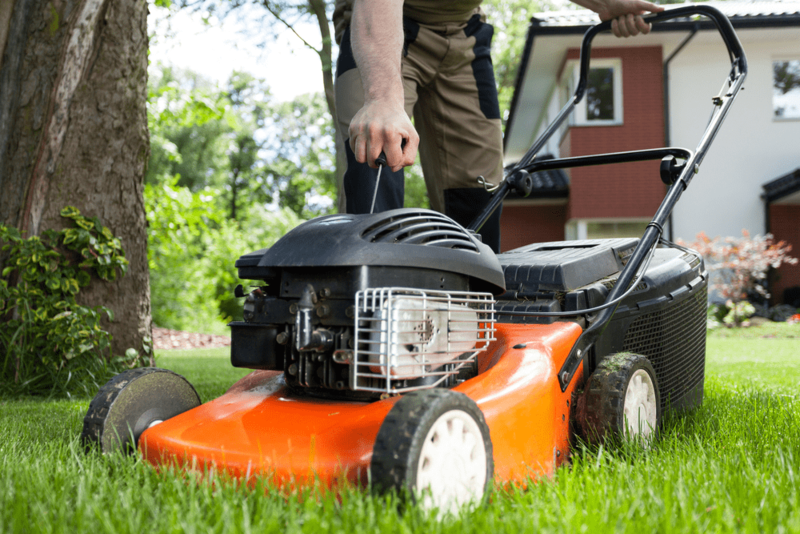 Properly mowing your lawn is simply the beginning. If you want a professionally done lawn, you need the best trimmer line or weed eater string or strimmer line to take care of the edges. Today we will look at the top 7 trimmer lines that you should consider when you hit the market to get one. How do you ensure that you buy a trimmer line that you require for your garden and the best one? If you are looking for a trimmer line that will offer you more control of your lawn, then Worx WA0010 is the product for you. 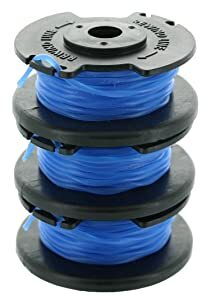 You cannot go wrong with this line because it’s packed with 10 feet line per spool. Made of copolymer nylon resin, this line is extremely durable and also very light. Best for edging, it boasts of an aerodynamic design which assists you to enjoy a clean cut at a reasonable pace. The best thing, it features a malleable strength of 100 pounds. That means that it will cut more efficiently thicker and harder grasses or weeds than other brands. The aerodynamic design increases its life by about 25 percent. The line is able to support most models of works grass trimmer. With that said, we would recommend you to check the models for compatibility before you buy it. Made of durable polymer nylon resin. Maybe you are a home landscaper and need a weed-whacker around your compound every once per week or month. 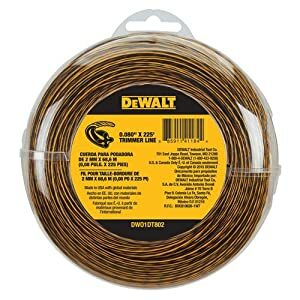 If so, you need a light-duty trimmer line, and this means getting the DEWALT DW01DT802. The product is made of malleable, impact-resistant material that makes it last for years. 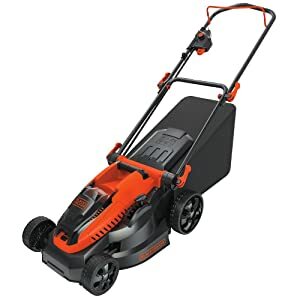 It has a 0.08-inch diameter, making it the ideal line to use for light-duty chores such as trimming grass near mulch beds or evening out edges. Coming in an awesome spool of 225 feet, this line is very affordable when you compare to other brands out there. A wound-style trimmer line, it is tough and able to slice via weeds and grass with little hesitance. In addition to working perfectly with DEWALT home trimmers, this product also works well with Ryobi, Kobalt, and other chosen brands. It is versatile and reliable. This is an electric trimmer line that is compatible with all GreenWorks trimmers to ensure that you get a versatile product. 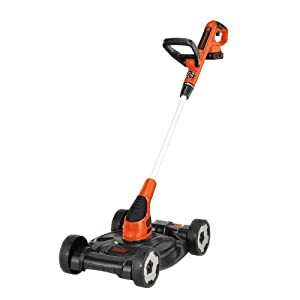 It is perfect for 20, 24, and 40V string trimmers and is made of durable material making it ideal for use in most lawns. It offers a diameter of 0.065 inches, meaning it is a light-duty unit that is perfect for echo. 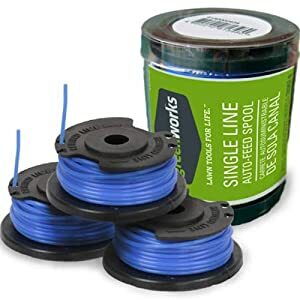 The line comes with 1-replacement spool for dual trimmer line and it is one of the best products that GreenWorks has on offer. The best thing, the product comes with a user manual to help you assemble it with ease. It also comes with a 3 years warranty – you can return the product within this period and get back your cash. It gets cut after a while. With Ryobi one+, you can say goodbye to winding up line by yourself. This product helps you to save time when managing your garden or lawn. It keeps the grass edge looking beautiful and reduces weeds to ensure that your patio and lawn is even more beautiful. The best thing, the product allows you to get back to business within minutes by snapping it to Ryobi cordless weed and grass whacker. It is UV protected to ensure that it lasts longer while working under the hot sun. This product is recommended for a person looking for an easy and quick solution for all trimmer line needs. Takes time to get used to this product. This 220-foot cutting line is very affordable but it wasn’t made cheap. It features a multi-sided edge (six-point star) which helps you to achieve that smooth cut. 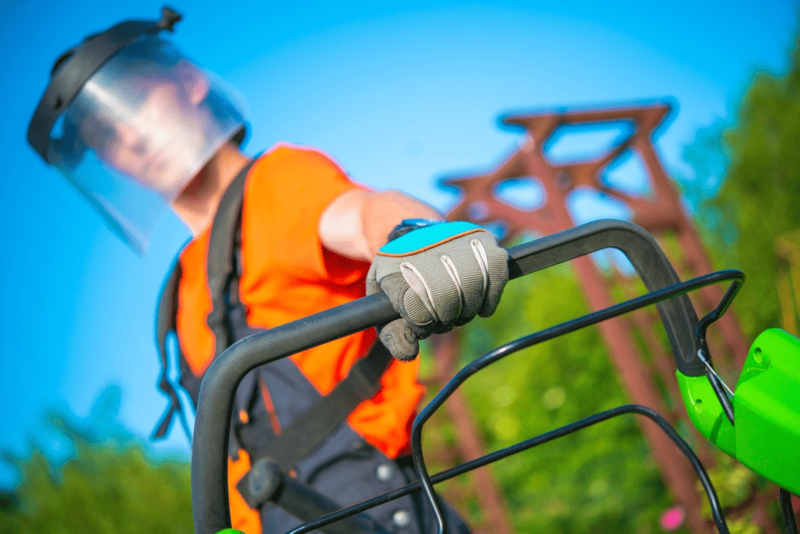 The unit reduces your work time since you don’t need to move back and forth to guarantee the cleanliness of your lawn. Whether you own an electric or gas trimmer, this line is compatible. It comes with a great diameter of 0.065-inch which enables to do all your backyard jobs with ease. What you might love about this product is that every single package has 11 refills – you don’t need to keep lots of spools in your store. The other feature of this product is that you don’t require your scissors when using this trimmer line since it has its own cutting equipment. 6 point star multi-side product. Compatible for electric and gas trimmer. 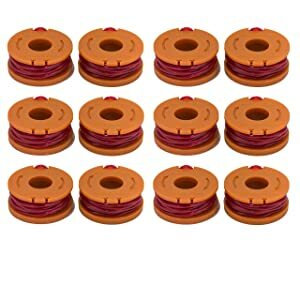 This trimmer line fits multiple models including GH400 to GH912, ST6600 to ST7700, CST1000 to CST2000, MTC220, MTE912, NST2018 to NST2118, LTS220, and LST136. It features a premium 30 feet 0.065 inches diameter that is perfect for superior feed. The product reduces the time you spend winding trimmers by almost 90%. 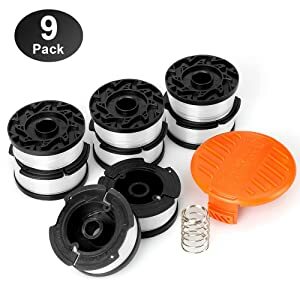 The trimmer comes with 1 pack replacement spool cap cover, 8 pack 0.065 inches replacement trimmer spool, and 1 pack replacement spring. The product comes with a 3 years warranty to show you just how durable the trimmer line is. Compatible with most models, this trimmer line is constructed from copolymer nylon resin as well as synthetic material to ensure that it last longer. The product is designed with a beautiful oval aerodynamic shape and it last longer than other models by up 25% longer. This unit is softer, allowing it to stretch and absorb the impact of hard areas making it perfect for chain link fence. It features over 100lbs of tensile strength – older models only provide 68lbs. this product is flexible and durable. Features over 100lbs of tensile strength. From our review, we would recommend the Worx WA0010 6-Pack Replacement Trimmer Line. It is made of copolymer nylon resin to ensure that it lasts for long and is lightweight; perfect for residential use. 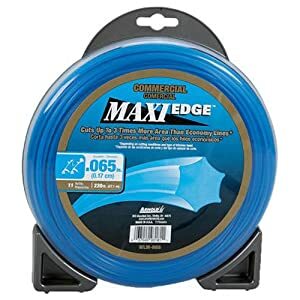 Other great things that have made this product our top choice is the fact that it’s a Multi-sided product and offers 100 pounds tensile strength. There are a lot of factors that you should consider when buying a trimmer line that is perfect for your garden. While there are hundreds of these factors, don’t be intimidated; by taking one step at a time, you will eventually determine the best option for your need. As you go through the different trimmer line on the market today, it is vital you know that they don’t come in a single style. Knowing the different styles out there will help you to choose the trimmer line that will provide you with the service you need. If you have thick weeds or a huge yard, you should consider getting a multi-sided product. It is also the perfect unit to use for commercial gardening. As its name suggests, it features multiple sides with the square, star, and pentagon being the readily available shapes. These sides help to cut through thick weeds more efficiently and faster than a single side product. These models also cut the grass and weeds very fast, thanks to the sides. Sadly, these products often break when they come in contact with stones, curbs, or fences. Round trimmers are the most common of the different styles on the shelves. They are the best product for trimming grass edges and eliminating weeds around residential areas. The standard and basic shape of these products mean that they don’t wear out as fast as other models and they are very easy to replace. Trimmer lines that come in round shape break less when they hit concrete or trees, and so they last longer. The only major con of these products is that they can’t handle thick weeds or huge areas. Twisted style trimmer lines are perfect for rugged commercial use as well as for clearing gardens and lawns with lots of heavy and thick weeds. They are the strongest products for professional use because they don’t break when they hit concrete or trees. The twisting provides them additional strength and enhances their efficiency while also eliminating noise. Twisting also reduces the vibrations and make sure that you get an even and clean cut. Square trimmer lines are perfect for cutting dense or thick weeds because they have multiple sides. These lines are thicker and bigger than other styles which offer them the ability to cut weeds and grass in their path. If you wish to clear weeds or grass in place with trees and rocks, this is the perfect trimmer for you – it will do the task as if there are no trees or stones. These lines are for big chores, and so they aren’t recommended for light trimming on your backyard or lawn. Serrated trimmer lines are perfect for use when you have lots of weeds around your home or if you are a professional yard trimmer. These lines are also perfect for use in large areas with tick plants. They accomplish your task within minutes. 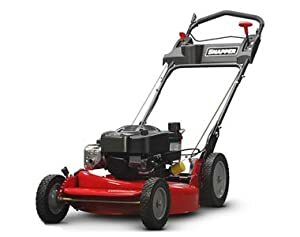 The lines come with edges that act and look like teeth, and they provide them with the ability to cut via tall grass and thick leaves while leaving a neat and clean trim. The added trimming power of thee lines make them ideal for use when doing medium to heavy trimming tasks. Before you settle on a specific trimmer line, you should also consider the weight and diameter of the line. These lines are recommended for light-duty work such as cutting grass and trimming weeds. They are perfect for residential gardens with common, light weeds. These products are less expensive when compared with other models. The required diameter is 0.065 to 0.08 inches. These are perfect for huge residential gardens or lawns with heavier weeds. You can also buy these products for light commercial use. They are more expensive than light duty ones, but they don’t break when they hit thick weeds. These products make your task to be easier. The required diameter is 0.085 to 0.105 inches. Heavy duty lines are ideal for gigantic yards or industrial landscaping. They are recommended for areas with heavy trimming. If you have lots of tough grass or weeds and you feel like you have been trimming for years, heavy-duty lines can do the job for you. They are perfect for professional use. The required diameter is 0.110+ inches. Another factor that you should consider when buying a trimmer line is the material used to construct it. Nylon lines are the most common types you will find on the market. These are hardened, synthetic products that work for almost all the situations. If you get it in your preferred diameter and shape, this product will offer you the service you need. These are a newer entry into this industry. Their cutting power is better than the nylon ones. As you might have guessed, they do cost more than nylon ones. Ordinary lawn owners don’t need this product but they work well for heavy duty chores. You have two main options with trimmer lines: spooled or pre-cut. Before you even think about this, look at the manual of the trimmer and see what kind of line it suggests. Compatibility is determined by the trimmer head. If you have or intend to replace this part of your product, then take this into consideration when buying the line. If you own a fixed head trimmer, then you should go for a pre-cut line. Twist feed or bump feed system mean you will need to go for a spooled line. Rather than a single long length, these products come in single, individual lengths. They are very easy and quick to change. On the downside, you will need to change them regularly if you don’t gauge the durability effectively. Most trimmers use a spooled line which is enclosed around the head. Watch out to see how simple the reload will be. This will vary from one trimmer to the other. As with most factors of choosing the best line for your need, you do not have a lot of choices here. The type of product you have will determine whether you will go for a spooled line or a pre-cut line. What is the Point of a Trimmer Line? Line trimmers are long electrical tools which can cut down grass and weeds in different areas such as lawn, garden, shed, or mulch. These items are a necessity in any gardener’s arsenal, enabling you to reach every corner of your yard with ease and convenience. Trimmer lines are the active elements in a line trimmer – without a line, a trimmer cannot serve any purpose. Along, string-like element, a trimmer line is installed into a line trimmer to enable it to whip around and cut via grass and weeds. All landscapers, professional and rockies, need to have these tools. However, not every gardener will need the same kind of trimmer. Some people do little work around their home and can get a simple, thin, nylon line. Others do professional work and should get a thicker and tougher product. Randomly buying a trimmer line will not do you any good, mainly because these products are designed and built in different ways. In addition, there are other things that will make your purchase offer you value for money. Here are a few tricks and tips of trimmer lines. One critical thing that you should keep in mind is that trimmer lines require a good storage area. These products shouldn’t be exposed to UV light. A line exposed to direct sunlight will break easily. When you are not using your line, it is best you store it in a cool and dry area. Additionally, if you try to get more from your product using the bump head, both the head and the line will be prone to tear and wear. Different trimmers have different weights. Some of the heavy-duty products are studier and ticker than light-duty ones. Of course, they add an extra weight to your trimmer. If you don’t want to feel a noticeable increase in weight, you can opt for a lightweight line. The color of the trimmer line won’t matter for most people, but you should always go for your favorite color. These lines come in different colors, sizes, and shapes, so you can always get the one that suits your need and taste. In particular, most individuals prefer to buy green or dark-colored trimmer line because they don’t get stained easily. Q: Why does my trimmer line break? A: A trimmer line might break due to line crowding. This happens when the head is held near the objects that can damage the line such as cement, fencing, brick, or rocks. Ensuring that the line is fully-stretched and avoiding crowding will reduce the breakage. Q: Why won’t my trimmer start? A: The majority of starting problems are caused by fuel systems on your trimmer line. Carbon remains will slowly build up in the fuel line, carburetor, and cylinder, suffocating the engine of fuel. If you trimmer doesn’t start, check the tank to make sure that the air is getting in smoothly. Q: My trimmer line breaks off the head. What is the problem? A: This often occurs if the head bumped enough and it becomes very short for centrifugal force to carry the line. Ensure that you bump the head when advancing your trimmer line. Other than a lawn mower, the best trimmer line is perhaps the most critical tool in a lawn owner store. This powerful tool reaches all the areas that your mower cannot reach and does a great job. To make your product work effectively, ensure that you set it correctly and choose a product that will last long, offers you the necessary services, and is affordable.